It was almost 80 degrees at 8:30 yesterday morning when the Santa Monica Farmers’ Market opened for business. Usually by 9 o’clock, strollers and carts clog Arizona Avenue from 2nd to 4th Streets, but this week the streets were practically barren. It was just too damn hot. What do you do when it’s too hot to shop? Call a professional. This week we bring you a round up of individuals and services that shop the Wednesday Farmers Market, so that you don’t have to. Linda is literally your personal farmers market shopper. Her clients range from singles who can’t make it to the market, to families of five and small catering companies. What differentiates her? “I really pick the best of the best,” she says. Plus, she can shop at all of the farmers stands including chef-favorites like Windrose Farms, Schaner Farms and Harry’s Berries, which aren’t available on sites like Good Eggs and Fresh Nation. “I have clients who go to restaurants like Cooks County and taste an ingredient and the tell me, ‘I want that!’ and I can get them those things.” Plus, she’s not dipping into the farmers profits. Even when she does receive a discount for buying in bulk, that discount is passed on to the customer. Linda shops the Wednesday and Saturday Downtown Santa Monica Markets and the Sunday Hollywood Market. $$$$: Fairies don’t come cheap. She charges a hefty fee for every shopping trip. The price varies depending on the load and the location, but for highly personal service (yes her customers can text her for last minute additions) and access to every stand at the market, it’s worth it. Giles and Laura started small. They signed on 150 customers in their own neighborhood in Venice before launching the Venice Merchant in 2012. Since then, they have added two new neighborhoods – Santa Monica and Topanga and delivery to all of LA is coming soon. The husband and wife duo deliver fully customizable weekly or bimonthly fruit and vegetable boxes with recipes to your door. Add-ins include everything from grass fed beef and line caught salmon to housemade bone-broth and almond milk. $$$$: The merchant requires a one time sign-up fee of $40, but subscribers can share a 50% discount with new members which means most people sign up for $20. Small produce boxes start at $29 and a regular crate costs $44.99. You can customize your crate, but if you take out ingredients you are given a credit to purchase other options. Produce prices are cheaper than Whole Foods and Good Eggs, but on par with farmers market prices. 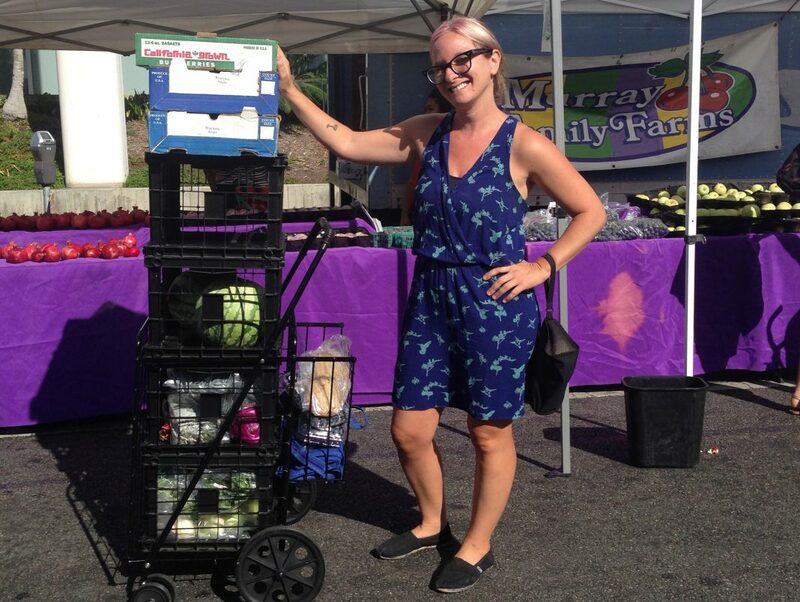 Jennifer Piette was early to the produce delivery concept. She shops both the Wednesday Santa Monica and Saturday Santa Barbara markets each week to source 100% pesticide-free crops from some of So Cal’s most respected farmers. On top of that, she offers local pastured meat, nuts and grains, as well as locally produced snacks, bakery goods and pantry items. On her site she offers all of her items a la carte as well as produce boxes, specialty boxes (think “breakfast box” or “gluten and dairy free box”) and their popular “real food” boxes which contain ingredients and recipes for a themed dinner party. “We’re really curating these weekly boxes into a food adventure,” she says. “It’s not all chopped and diced like a meal kit, but it’s really good for inspiration and all the ingredients are in there.” A recent “real food” box included okra, chicken and lard from Lindy & Grundy for a Southern inspired fried chicken dinner. $$$$: Thoughtfully curated, well sourced food comes at a premium, but the website is well designed and their free on-line journal Forage and Pasture shares stories of the beekeepers and fisherman you are ordering from. If it’s too much for a weekly splurge, their boxes make great gifts. Founded by San Francisco tech entrepreneurs Rob Spiro and Alon Salant, Good Eggs began as an online portal connecting consumers with artisanal food producers. After a successful beta phase in Northern California, Good Eggs expanded to Brooklyn, New Orleans and Los Angeles in 2013. While their strength lies in locally produced artisan products like almond milk and carefully crafted kimchi, the produce options are commendable and customizable. If you’re an apple snob, you may be disappointed by the choice of Gala or Fuji, but the fact that they are sourced from Cuyama Orchards and Jimenez Family Farms might make up for the lack of variety. The customer service cannot be beat. Both the operations team and drivers are constantly in touch with customers should anything change in regards to your order. Plus, the interface is seamless and the ability to get a baguette from Bread Lounge and Sun Gold tomatoes from Jimenez Farm in the same delivery is pretty irresistible. $$$$: Good Eggs prides itself on not taking a cut from their purveyors. Vendors set the price and Good Eggs charges a 25% markup. If you’re already shocked that a basket of farmers’ market blackberries is $4, you may balk at paying $5. Delivery is available daily and free on orders that exceed $30. Another tech industry veteran getting into the produce game, Antony Lee first launched Fresh Nation in his home state of Connecticut. So far, he has expanded to the unlikely duo of Westchester, NY and Los Angeles. Lee’s passion is farmers’ markets and his goal for Fresh Nation is to allow customers everywhere to shop at the farmers market from their computer. “The goal is to make the farmers markets bigger and stronger,” he told me. How does it differ from Good Eggs? Fresh Nation does not have a hub or warehouse, but instead takes produce from the farmers market directly to consumers. However, the main difference appears to be in their pricing models. While Good Eggs tacks on a percentage to each item, Fresh Nation takes a commission from farmers based on what they sell. Reed avocados from Polito Family Farms are $3.50/lb on Fresh Nation by $4.59/lb on Good Eggs. Like other services, supplemental items like meat and dairy can be ordered in addition to a la carte and curated boxes of produce. The only drawback is the interface which is less intuitive and less beautiful than competitors. $$$$: As noted above, some items are less expensive than competitor Good Eggs. However, like Good Eggs, the farmer selection is currently limited. Delivery zone includes South Bay, Westside, all of Los Angeles and the Valley will launch shortly. The delivery fee is $5 per order but is waived on orders of $75 or more.